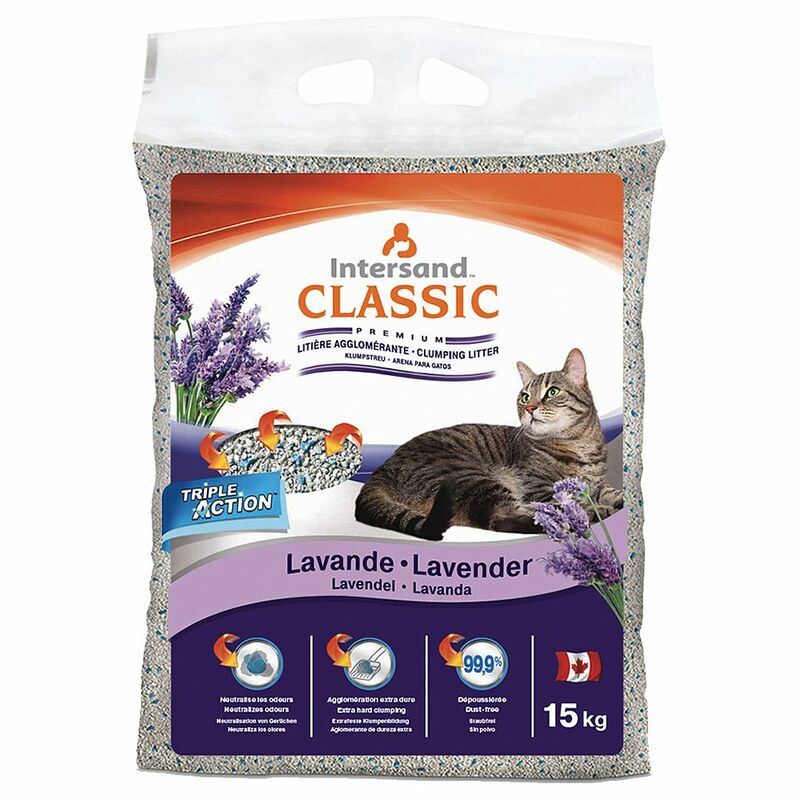 Extreme ClaΒic Lavender scented cat litter is a clumping litter made from premium quality natural sodium bentonite from Canada. This delicately lavender scented litter quickly forms very hard clumps which do not break up. It is very economical in use: 15 kg Extreme ClaΒic cat litter equals approx. 45 kg traditional cat litter and provides up to 3½ months of litter per cat. Zeolite, a natural mineral granule is added to ensure even more effect odour absorption. Extreme ClaΒic Lavender with its TRIPLE ACTION™ formula can absorb up to 400% of its own weight in liquid. The patented formula works in three ways: Extreme ClaΒic cat litter absorbs and neutralises unpleasant odours Extra hard clumping 99. 9% dust-free Extreme ClaΒic Lavender Scented Cat Litter at a glance: Clumping litter made from premium fine grained Canadian bentonite Delicate, natural scent of lavender Bentonite with blue zeolite For better odour absorption TRIPLE ACTION™: absorbs and neutralises odour, very hard clumping, 99.9% dust-free Liquid absorption 400%, very economical in use Ideal for multi cat households, cats which have not been neutered and older cats The top quality bentonite litter has been refined with blue zeolite. Zeolites are natural minerals (coral) and have excellent moisture absorption properties. The structure of these minerals gives it an additional odour binding and antiseptic effect and these features help to absorb the smell of urine and excrement. Zeolite is completely natural so it can be disposed of with the organic household waste or with the normal waste.